As a digital marketing agency, you understand the various digital channels for marketing online provide the best way to expand your audience and reach new clients. Indeed, your very existence requires that you be able to sell this idea in the form of services to local businesses. But an effective digital marketing strategy often requires something that’s not true for most new digital marketing agencies: an established web presence. How so? Well, what if your website is on the 4th page of Google’s search results, or worse, and you have 75 followers on Facebook, half of which are your friends or family? How do you drive growth online and generate leads? Agencies still building their web presence can leverage online marketing – just in slightly different ways. We’ll discuss how to effectively use three digital channels that can bring results even when you’re still chasing the first page (or the 4th page) of Google’s search results. To realize the full potential of online marketing, let’s lay a digital foundation starting with your website. Then we’ll move on to claiming your GMB listing and setting up key social media profiles. Check out our checklist for starting an SEO agency for more great tips. You need a place to put your content and you need a place to start optimizing for local search. WordPress is free. Buying a domain and hosting is relatively inexpensive. Thanks to free templates and themes, you can do this without breaking the bank and without being a web developer. Optimizing your website to get more website leads means you create localized content that says you are the “best digital marketing agency in Wichita, Kansas” and that your agency “helps Wichita businesses grow” – or whatever location is appropriate. Do this in your copy, in your blog posts, and in the meta title and description for each page and post. Your GMB listing is where searchers can easily find your address and hours of operation. Searchers will also see reviews of your agency. This helps to legitimize your business because it shows that other people have trusted you. Setting up Google My Business is step one of building a presence on Google’s local search results and it can give your agency prime real estate on local searches for relevant or branded keywords. Chances are, you’ve created a Facebook page before – your own personal page. Do the same, but for your agency. Follow pages that provide value to your agency, post content or images that your future clients will like and interact with other businesses or people. Your personal LinkedIn page will vary greatly from your Facebook page in that it will be less about you and more about your business; specifically, what you as the owner bring to the business and how you help local businesses grow. Make sure you have relevant information about your agency on your Facebook business page and your LinkedIn page- hours, location, the services your agency provides. This will come in handy later when we discuss ranking in local search results and leveraging your reputation online to get leads. Facebook is arguably the most valuable platform for social media marketing. You can target a very specific group with your content and, for a few dollars, extend your reach beyond your followers. By joining the right Facebook groups, you instantly have an audience all of whom are your potential clients. Just don’t spam the group with post after post. Only share content the group will find valuable – which should be the only content you create. 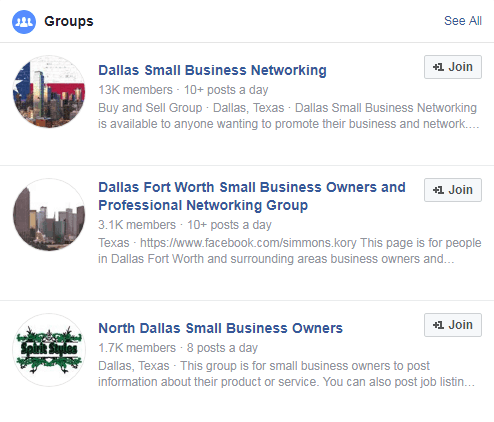 Simply search Facebook for “small businesses Dallas” or whatever city you are located in and join the groups. You need to join with your personal profile but it’s a good idea to create a Facebook Business Page and your website because the group admins might require these to join. Let’s say you have a small marketing budget that you can use for customer acquisition and to build an audience. Facebook is a good place to use it. By boosting a post on Facebook, you can dramatically increase your target audience. Because you are paying, boost the right post to the right people. For your target audience, you have three choices – your followers, your followers and their friends, or an audience based on targeting. 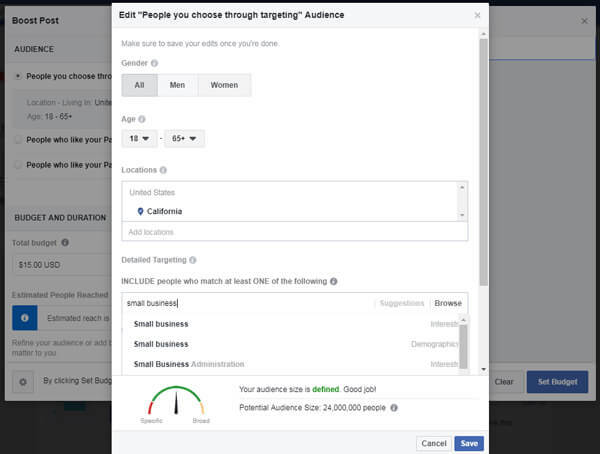 The audience based on targeting is where boosting really shows the benefit. You can target based on location, age, gender, and interests. LinkedIn can be an important part of your social media marketing strategy. It’s true that the users of LinkedIn are a more business-like audience but that fact helps you build legitimacy for your digital marketing agency. For many agencies, LinkedIn is a great way to drive growth. 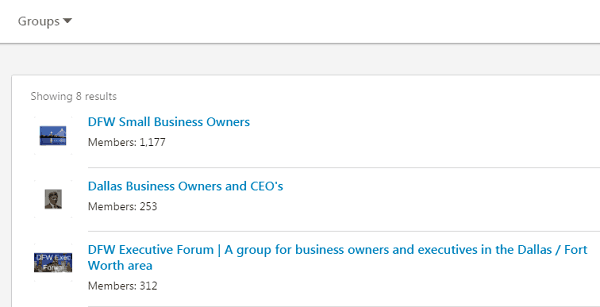 LinkedIn is unique in that it has a platform for content creation and publishing – LinkedIn Publishing. Depending on your profile privacy settings, the content you create via LinkedIn Publishing will be visible to the public and can be searched for by topic – an effective marketing tool for sure. For those of you that just groaned about creating content on your website blog and LinkedIn, worry not. You can simply publish a “sneak preview” of your blog articles – publishing the title and a couple of intro paragraphs then a link to your website blog post (a nofollow backlink is a part of a healthy backlink profile). Like Facebook, LinkedIn also has groups that you can join and post content, comment on other peoples posts, or ask questions and otherwise generate leads. However, because LinkedIn is a business social networking site, groups on LinkedIn are sometimes strict on who can join. Make sure your personal LinkedIn page is updated and relevant to your marketing agency and your target audience. It can be good to also have a LinkedIn page for your agency to further establish legitimacy. However, when reaching out to people and posting content, use your personal profile – connecting with a real person is a much more effective for B2B Networking versus a business profile. Similar to Facebook, when sharing blog posts from your website to LinkedIn, the more engagement your post gets, the more visibility LinkedIn will give it. You can restrict this to only your connections but that doesn’t help grow your business. 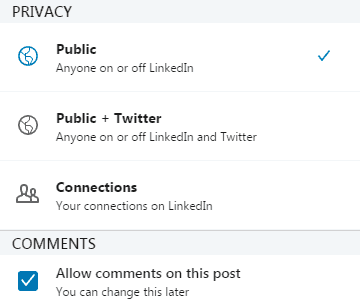 According to LinkedIn, your 2nd- and 3rd-degree connections can see your posts if your 1st-degree connections share, comment, or like the post. This can be difficult with a limited following but if you’re leveraging the groups like suggested earlier plus commenting and interacting with their posts, your engagements will increase. In our First Things First section, you set up your website, optimized it for local search and claimed your Google My Business listing. This means you’ve completed 50% of what it takes to start getting traffic via Google’s local search results. In a way, this section is cheating because rather than telling you how to reach your audience without ranking on the search engines, I’m going to discuss some steps you can take to for actual local search engine optimization. Depending on your location, it’s not as difficult as you might think. There are many business listings that can give you a real chance of ranking in Google’s local search results. Many are well-known while others are not but still provide value. 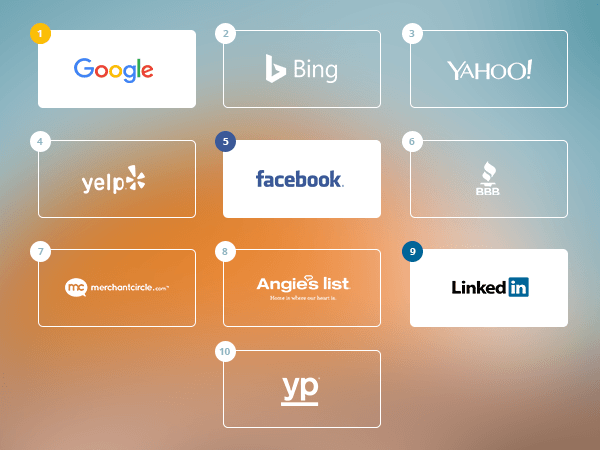 If you followed our suggestions for marketing your agency online without a web presence, you already have 3 of the top 10 local business directories, according to HubSpot. The key here is to ensure consistent NAP (name, address, and phone number) across each listing (including Facebook) and your website. Creating business listings with inconsistent NAP can hurt your chances of ranking locally – it’s confusing to Google and it’s confusing to actual people looking for your agency. Now that you have built listings on the top review sites and business directories, you can start getting reviews. Of course, you need clients to get reviews. We have a library of free white label marketing materials that can help you get started. The key to getting reviews is to proactively ask your clients as you acquire them. People are generally willing to leave reviews when prompted. A good tactic to get initial reviews is to consider your own reputation synonymous with your business reputation and ask people with whom you have a professional relationship with to attest to your integrity, work ethic, reliability, etc. What do small businesses in your geographic location care about? Is there a local trend you can cover in your content? Every piece of content on your website should be written for the audience in your own backyard and for each stage of the customer journey. Starter ideas for your website’s blog include writing about news-worthy local events, business events you attend, seasonal marketing tips, and how your agency helps local businesses grow. Don’t forget to share this with your newly joined groups and on your social media profiles. Check out our Local SEO Guide for more details on how to really boost your local presence on Google. The next set of solutions require you to have a marketing budget. Doesn’t have to be a lot. In fact, to begin, it shouldn’t be a lot because it takes time to build the right strategy and there may be mistakes when you’re getting started. The ads section of the search results is the closest thing to an even playing field when it comes to Google. With Google AdWords, you can put your agency on the first page of Google search results for keywords that indicate real buying intent and branded keywords for your competitors. Budget – Google Ads allows you to set a daily or monthly budget and it can be changed at any time. This allows your strategy to be fluid. If an ad isn’t performing, tweak it, allocate less money to it or get rid of it altogether. With a higher budget, you can target more people. But your keyword strategy, you can target the right people. Keyword Strategy – Determining your target keywords can be tricky and if you’re not careful, you can blow your marketing budget quickly. An obvious choice is something like “digital marketing Wichita” or “SEO services Dallas”. Google provides a helpful breakdown on how to choose your keywords. Ad Copy – Ad copy is the text that potential clients see on the ad. Keyword relevancy between the ad copy and the page on your website where you send them affects your Quality Score which impacts your ROI and conversion rates. Add a compelling call to action to further improve your conversion rates. Ads for Facebook are created via Facebook Business. There are several types of ads and each can accomplish different things like conversions, brand awareness, video views, promoting your business page or website and more. Audience options include custom audience, location, gender, age, demographics, interests, and behaviors. Budgets are set daily or for the lifetime of the ad. You can target a potentially large audience for a few dollars per day and your options for display include, multiple photos, one photo (6 different ads), video, or slideshow. The challenge for Facebook Ads is the content of the actual ad. The ads will come with text in which you can link back to your website but should also include compelling copy that entices people to click. The more original your image and copy, the more likely your audience will click it. You can, however, find free images on Pixabay and Pikwizard. Before we dive into LinkedIn ads, a word of caution: We previously discussed creating content on LinkedIn and in that case, you have nothing to lose – it’s free. Posting ads on LinkedIn is not free. LinkedIn varies from Facebook in that it has a small but more professional audience. If your audience uses LinkedIn, then buying ads can bring value. It’s an important question and will determine whether you explore LinkedIn as a marketing channel. There are three ways to advertise on LinkedIn Marketing Solutions – Sponsored Content, Text Ads and Sponsored InMail. The latter, Sponsored InMail, are direct messages to specific people. A little brazen for new digital marketing agencies. Therefore, we recommend Text Ads and, if you have a really good blog post, Sponsored Content. The more you use online marketing channels for your agency, the larger your web presence grows. Creating new content, acquiring engagements on your social media posts, and all your other digital marketing efforts ultimately drive traffic to your website. Soon, your position in the search results can start climbing. In the meantime, you have multiple platforms that provide at least a starting point for marketing your digital agency and you have a partner in SEOReseller that can help you build your agency from the ground up into a local business-growing machine.